More Legal Careers on the line - who is really to blame? We are less than two weeks into a new year, and we have already had reports of young lawyers getting into major difficulties. Both are reported in Legal Futures . The first follows a familiar pattern. The solicitor in question had failed to obtain adequate After the Event Insurance. This meant that, when a matter was discontinued, the client or the firm would have been responsible for the other side’s costs. She tried to cover up the error by created forged insurance schedules in the hope that the insurers would not ask any questions. She then fabricated attendance notes to try and support the cover up. It is no great surprise then that she has been struck off the roll for dishonesty. This is becoming alarmingly repetitive. Yet again, a career is brought to a tragic end because concealment seems preferable to honesty. I am beginning to sound like a broken record but the message for solicitors is clear – not only is honesty the better option, it is the only option. The discomfort of a confession is far less painful than the end of your career. But the sheer number of such cases does raise an equally disturbing issue. Why are these lawyers so afraid to admit a mistake? Is there such a culture of fear across the legal profession? This is partly demonstrated in the second report. The lawyer in question was suffering from mental health issues. She later misled her employers, a client and backdated letters. The tribunal criticised the firm for placing her undue pressure. Her health issues made her more vulnerable to a negative reaction to the letter. The firm should have been alerted to the warning signs of her illness. The firm carried a significant portion of the blame and had not supported its employee. She was suspended for two years – but such suspension was itself suspended for three years. Anyone who has managed a law firm is aware of the need to ensure that cases are turned over quickly and efficiently. Managers are likely to be under similar pressures – from partners, banks, creditors… There are many ways in which this can be addressed. Supervision and support are crucial. If a solicitor is falling behind a target there might be any number of reasons – too many cases, an unrealistic target, illness (as in this case), lack of support. There can never be any excuse for managers to bully their lawyers in order to improve performance. Members of a team need to know that there is someone that they can speak to if they are struggling. That someone is not there to judge but to guide and support. Many of these cases that we are seeing involve a young lawyers desperately trying, and failing, to sort out a crisis on their own. Why are they working in such isolation in the first place? I think that the agenda is shifting here. I used to emphasise the importance of lawyers not being afraid to speak up if there is an issue. The message is now well and truly one for managers. Can my lawyers speak to me without being ‘terrified’ of the reaction? What support do I offer? Aggressive treatment of staff is always counterproductive. We are likely to see more cases where firms find themselves under scrutiny. Most firms do care for their staff. Clearly others do not. And this has to change. Steve Cornforth is a solicitor who owns the Steve Cornforth Consultancy providing Management Support, Compliance Advice and Training for Lawyers and Law Firms. 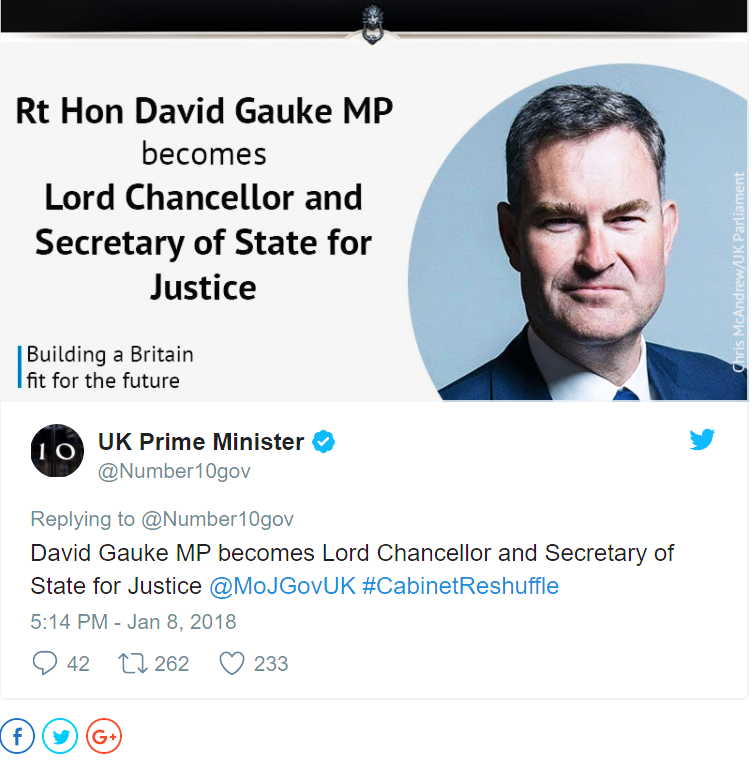 One thing which can always be predicted in any Cabinet Reshuffle is that we will have a new Justice Secretary/Lord Chancellor. It is like the first day of every year at Hogwarts when Dumbledore introduces the new Defence Against Dark Arts Teacher. The belief is that the job was jinxed by Lord Voldemort. Could there be a link?? He might even have some insight into the practice of law, albeit from a limited perspective. Mr Gauke trained at City firm, Richards Butler and qualified in 1997. He then moved the Macfarlanes and was there from 1999 until he entered Parliament in 2005. He first stood for election in 2001. So working in the law has never been a major part of his career path. But at least he has some knowledge of the legal world. So, we cannot expect a champion of the rights or ordinary people. Will he last until a new Hogwarts year? Will the government last that long? As things stand we should probably assume both. I foresee many battles ahead and do not hold out any great hope for huge changes in broadening access to justice this side of a General Election. But let us at least hope that he will take his constitutional role more seriously than some of his predecessors.